The meeting between architecture and park amid these two natures that make up the city reveals a place among the trees which is activated as a gather space: the Bauhaus memory and nowadays actions. An holistic approach that combines the curatorial and conservation techniques of the masterworks, a performative and event space-park which leads to an extending duality spread along the organization and the constructive aspects. 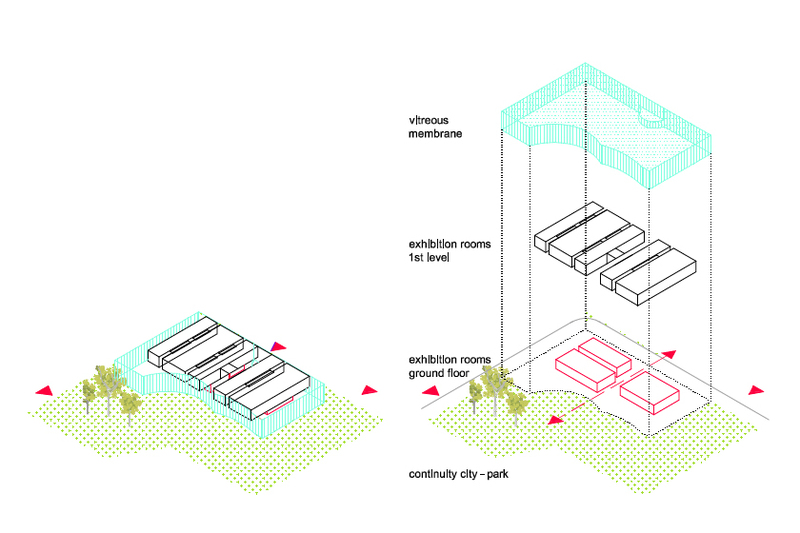 The spatial definition implies several atmospheres, from the introverted of the solitude exhibition rooms to the more extroverted rooms arising from user actions. 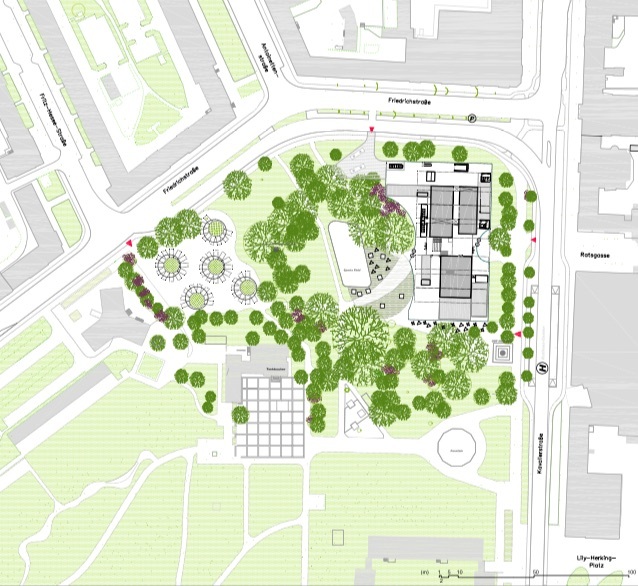 The museum is presented as an efficient volume which is affected by the existing conditions in the StadtPark and KavalierStraße. A path system integrates the atrio-landscape to the museum as a new and unique public space within the city, enabling the use of that space during the cold months. An architecture that invites to inhabit the park. Two natures, two constructive approaches. Enclosures are defined in a very stable architecture –in terms of temperature and HR conditions-. Against this air conditioned space forming a interface park-city-building that allows various sensory experiences to visitors. We define a techno-ethics machine as the one capable of developing their organizational, material and aesthetic performance based on a strong ethic of conservation, maintenance and renewal of the air in a very variable and differential volume conditions inside the museum and the exchanges with the outside. The museum configuration is extremely versatile offering multiple possibilities combining the provided boxes. This feature is indepent of the rooms openings to different urban settings: StadtPark and KavalierStraße. Also rooms can be arranged with different lighting possibilities. The museum is divided into different air quality levels. The spaces dedicated to permanent and temporary exhibition reaches the highest level of specificity in the air quality performance. Offices, workshops, education, cafeteria and so on are organized around the exhibition areas, organized and creating a second level of climatization. Finally, the third climate level (15ºC / 18ºC) is dedicated to the less-demanding activities inside the museum, transits and events. That means spaces like the lobby, the visitors center, workshop expansion places, café. 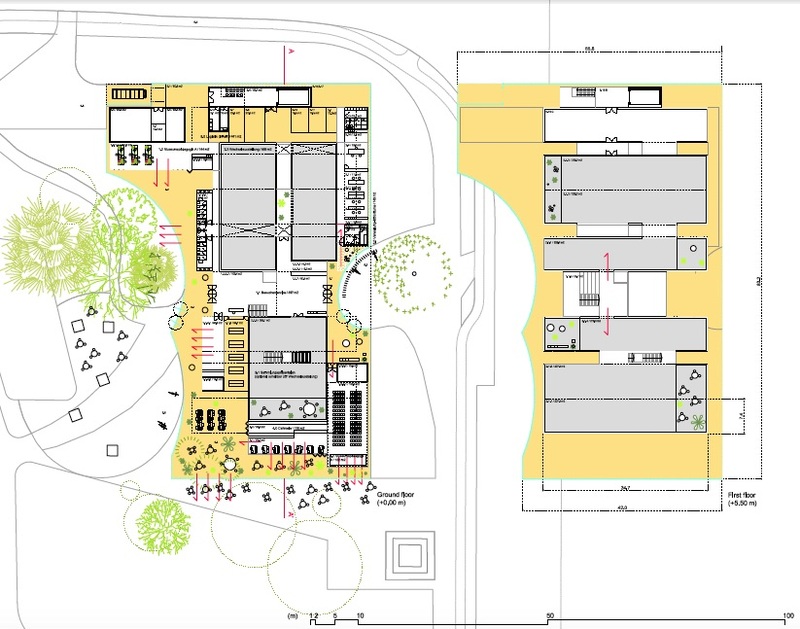 These spaces are organized as the previous level before the membrane which mediates the exterior contact: a more opened and permeable architecture.